We can ship to most addresses in the world. DHL (First Class Mail International Parcels) - our least expensive international option, delivery varies and may be up to 30 days. Because we love our customers we recommend using International Express to ensure you personally receive your gear. KiraGrace is not responsible for lost or stolen products once delivery leaves our warehouse and shipping fees are not refundable. We appreciate your cooperation and understanding. How do I find the best fit and size? I’m between a Small and a Medium, what size should I order? For Bottoms: if you usually wear a size 4 or 6, then go with a size Small. If you usually wear a size 8, then we recommend a size Medium. 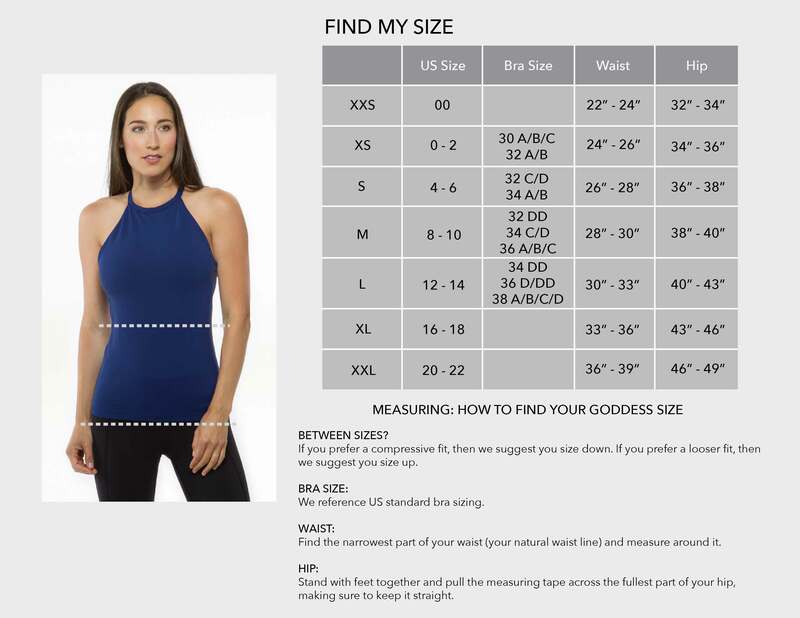 For Tops: we recommend a size Small if your bra size 34 A/B - 32 C/D. We recommend a size Medium If you are 34 C/D to 36 A-C.
Do you carry any large or XL sizes? Which tops have the best support? What is the fabric of my top or bottom? You can find the fabric details for each product when you click on the product and then click the Fabric & Care tab to the right of the Description. WOur goal is for you to feel beautiful in your KiraGrace gear. If you are not completely satisfied with your regular price purchase, you may return it within 14 days of the delivery date for a full refund. All returned merchandise must be in new, unused condition with original tags attached. Due to the intimate nature of activewear, we do not accept products that have been worn, altered, or washed. Merchandise received after 14 days of delivery will only be accepted at our discretion for a store credit or exchange. Items returned after 30 days of delivery are ineligible for return and will be automatically reshipped to the customer upon receipt at our warehouse. All merchandise must be purchased from KiraGrace.com (we cannot process returns from third parties). We are happy to provide customers within the United States a USPS return label for a convenience fee. If you select 'yes' to this prompt, KiraGrace will email you a pre-paid shipping label to send your return item(s). A $9.50 convenience fee will be deducted from your refund. You can also choose your own mail carrier and shipping method. How does the Little Black Box Subscription work? This is the ultimate essentials kit from KiraGrace! Treat yourself to the Little Black Box of luxurious fashion activewear delivered to your door. You may sign up monthly or quarterly to receive a little black box expertly curated with the latest fashion pieces. Every box includes: Two personally curated items (e.g. one top and one bottom). May include 1-2 additional active essentials (bra, headband, layering top, or any cute little piece that pulls the outfit together and gives you more wardrobing options). Only $149 per month or quarter for a value of over $250. Click here for more details.